Beautiful blackcurrant and Dulse Purpura use their plant power to the give an antioxidant boost to the skin. Purple corn and Jasmine combine to help fight the signs of aging and help skin look healthy and youthful. Powerful antioxidant anthocyanins in purple corn, including CG3, one of the most powerful antioxidants in existance, protect skin from the damage caused by free radicals. Antioxidants fight against the signs of aging by improving skin health and making it appear plumper and younger looking. New Zealand grown blackcurrant are known to have 1.5 times more anthocyanin than any other blackcurrants. This combined with ultra high levels of vitamin c make them a potent skin saviour. Vitamin C helps protect and repair skin against the effects of damaging UV rays. It has a sort lifespan so is much more powerful when activated just before use. Red algae, or dulse purpura is a nutrient rich bioactive compound. High in vitamins including vitamin b, which encourages that healthy glow by increasing circulation, red algae is packed with skin loving actives. Red algae boosts hydration to minimise the appearance of fine lines and wrinkles. Brazilian purple clay is rich is magnesium which promotes healthy cell maintenance and cell renewal. Purple corn and blackcurrant are packed with anthocyanins, a potent antioxidant. These bio-actives are combined with red algae to help fight the aging process by protecting again free radicals and repairing damaged cells. 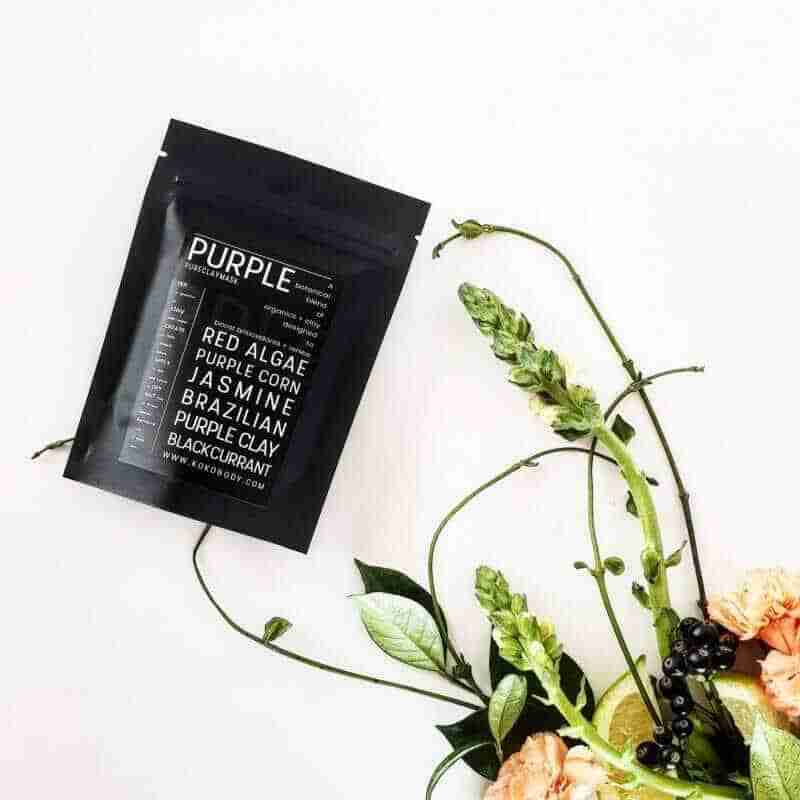 The combination of phytonutrients in the purple clay mask deters the breakdown of natural collagen in the skin to help prevent wrinkles, sagging skin and fine lines. To activate your mask mix one teaspoon of mask with half a teaspoon of water. Gradually add a little more water until you get a thick consistant paste. If the mixture is too thin add a little more Purple mask powder. If the mixture is too thick slowly add a little more water and mix until the consistancy is correct. Apply the mask using a brush or fingers working from your nose outwards. Avoid eye and mouth area. Apply thickly to avoid mask drying out too quickly and drawing moisture from your skin. Leave on for between 5 to 15 minutes then remove with a damp warm cloth.